Friday afternoon I got home from the gym, walked into the kitchen, saw the little lady and asked her the usual “Anything good in the mail today?”. Usually I’m asking about money in the form of affiliate checks or payments from a certain client that I had just won a small claims case from. “No but you have a box from EzineArticles, or something like that”. EzineArticles? I wonder why they would send me anything? Surely not a bill! 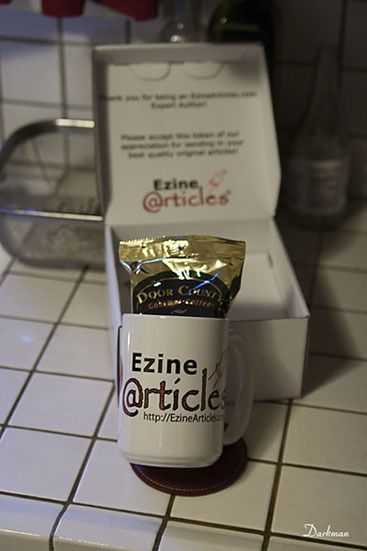 I went into the dining room and sure enough there was a plain white box, with the EzineArticles Logo on the top. A nice looking plain white box too! Maybe I could use it for shipping something. 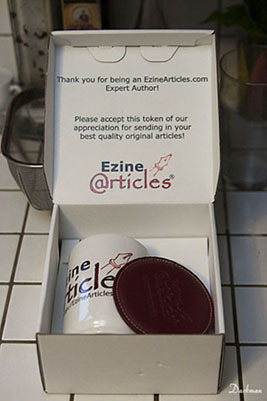 I opened it up to find a really nice coffee mug, a coaster and a small bag of coffee, with a note of thanks and appreciation for being an expert author at EzineArticles. Wow, I was floored. I honestly wasn’t expecting this, nor did I know they sent these things out to people who achieve the rank of “Expert Author” in their article directory. 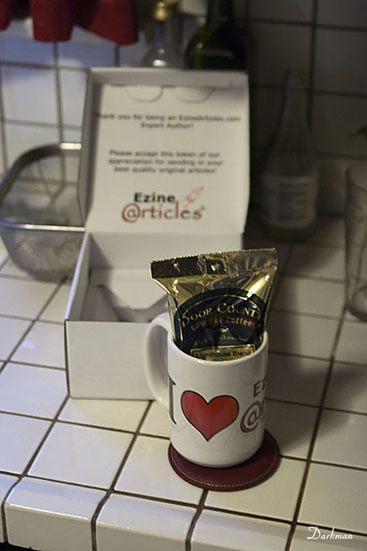 Really nice mug, heavy, big and with the I Heart EzineArticles on it. I drink coffee and I am also getting ready to stop drinking coffee, again, but I also have a small collection of coffee mugs I am proud of. Small achievement awards for myself for various things. This being the latest and most unexpected. 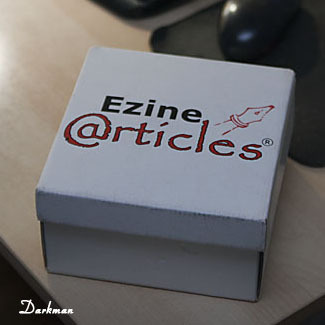 EzineArticles is the article directory of choice for me when it comes to article submissions to help with backlinks, and SERPs ranking with my little niche websites I build. 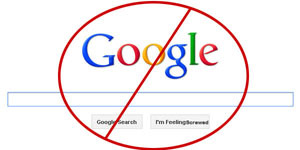 I’ve submitted a quite a few articles to them, just to help my sites get better ranking in Google, and to help drive traffic to the little sites. Aside from Google, they are the second biggest traffic source for my little niche websites. As I write this article I can’t help but smile that they sent me a really cool coffee mug, coaster and bag of coffee. Who does that for an Internet Marketer these days? A guy who sits in front of his computer working on ways of making money but writing. No one that I can think of. Which brings me to the topic of this post, gaining loyalty and trust through appreciation of your viewers. I don’t have anything to give away yet, but I am currently working on my first give away. I’m also working on my first eBook, but I can give away my knowledge of making income from small well crafted niche sites. Soon, by the end of this month my free product will be done, my eBook will hopefully be done as well. I will keep posting content explaining how I make money from small niche websites and I will continue to do my new podcast of people who are making it in online business. Which I also meant to mention, I don’t have a podcast for us this week, as I couldn’t get someone fast enough to fill the slot, but I will have someone for next week. Just working out the details as we speak. So giving away something really good to your readers may sometimes feel like your giving away money. Dave Navarro of The Launch Coach recently mentions this in a podcast interview done by Corbett Barr* of Think Traffic. He says if it feels like you’re giving away money, or if you’re saying to yourself you could sell this product, then you’re on the right track. If the product you just made, could make you a nice tidy sum of money, why not give it away and build some trust and loyalty amongst your readers? Doing this builds trust and loyalty with you, because your readers know that you are cranking out the good stuff, and they can trust you to put out good stuff when you say you’re going to. If you put out good stuff for free, and then you announce you’re releasing a product in which you intend to sell, then if your free such is good, your products that are for sale must be good as well, if not, better. People will come to expect good content and product from you, if they see what you give away if good and useful. Navarro also mentions if you feel you couldn’t sell the product for anything, you should go back to the drawing board and fix it. Dave Navarro also has an eBook called How To Launch The **** Out Of Your eBook. An eBook I have yet to read but I hear it is really good. I will be buying it soon enough and doing a review on it. Give away good content, give away good free stuff and gain loyalty and trust with your readers. *Be sure to listen to the podcast, it’s very informative. Guess what I'm drinking right now! Leather Coaster!!! I feel so special! I’ve picked up How to Launch the **** Out of your E-book a few months ago. Definitely helped me organize my launch better. Also, Dave’s got a great post walking you step-by-step how to set up E-junkie for selling an e-book. It’s nice to get that kind of “hey just do this advice” that you can just blindly follow. .-= Brett´s last blog ..Futurecasting- What You Can Expect From Me in 2011 =-. I’ll have to agree with you on the walk through, sometimes I just want to be show, once, maybe twice how something is done, and then I pretty much will have it. I’m going to have to get this book ASAP, from what people say about it. .-= Larry C.´s last blog ..Choose Your Topic Wisely When Doing A Niche Affiliate Site =-. I love that they sent that. I found your link through Dave Navarro’s site. He’s so right – giving things away does build loyalty, appreciation and not forgetting trust! I did a bumper e-course a week or so ago and I really thought hard whether to give it away or not – but the bottom line is I want targeted interested people and in order to do that I have to show them exactly what I’m working with. My niche is mostly based off the net which makes it a little bit more difficult. I want to show them how important it is to be on the net. I want them to succeed regardless of if they pay me or not. It’s a giving mindset that will get people further. 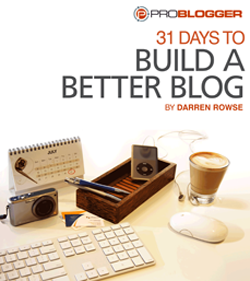 Anyway if I can help you in anyway let me know (drop me a line) – I’m excited that your eBook will be out soon! .-= Vanessa Reece – Internet Geekette´s last blog ..NEW GUIDE – HOW TO SET UP YOUR SELF-HOSTED WORDPRESS BLOG =-. Hey Vanessa, thanks for the comment, I’m interested in how the free product does for your audience. Please keep me posted. Dave’s a wealth of knowledge and man he gives away so much it’s not even funny. I’ve been looking to buy his eBook for a long time now, I need to just get it and start reading. .-= Larry C.´s last blog ..Business Intelligence and Strategy with David Crandall – Podcast Interview 2 =-. Okay, wait!….Your giving up COFFEE??!!?? Yeah, yeah. the rest was all interesting, good stuff too. And helpful as I am working on an ebook right now. But let’s get back to the headline…you are giving up coffee?? gulp. .-= Monkey´s last blog ..Help! When the Entrepreneur Boss Asks for the Impossible =-. Yeah, I gave it up for green tea, it was taxing my adrenals, and causing me to gain weight. So I switch to the green tea and then maybe eventually I’ll get off the green tea also. I love your post. 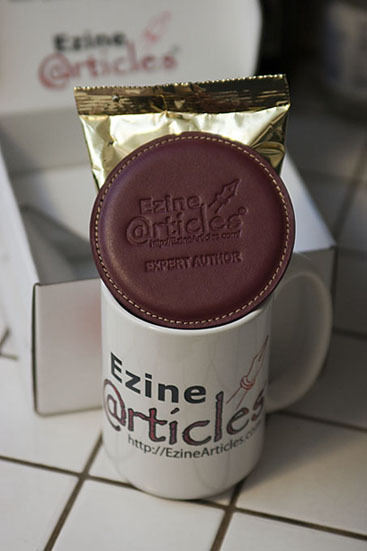 I to have received the mug and other small gifts from ezine articles and I have found that it makes me want to write more article. This is a fabulous way of branding and I think it is a great business building tool. Thanx for the fun post. .-= Vickie Success Systems When You Need it Most…Now´s last blog ..Is the Economy Turning A Corner Experts Weigh In =-. Everyone likes free gifts, especially unexpected ones. I’m still smiling because of it, I agree great way of building business. Way cool! Now I’m more motivated to go post some articles at ezinearticles. I had begun but got distracted and wandered away. And I have to figure out something neat to offer my own customers. Thanks for getting me thinking! .-= Amy LeForge´s last blog ..Vocabulary is Important in Parenting =-.